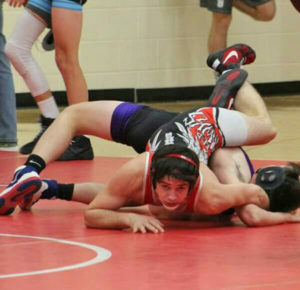 Aaron Smith tangles up his Greenville opponent on his way to a pin. The Varsity wrestlers traveled to Lowell to compete in the OK White Individual Championship on Friday, February 2. As a team, the Red Hawks finished the day only behind the four-time defending State Champions from Lowell. Jacob Galinis (140), Lucus Pienton (160) and Ryan Ringler (171) each reigned supreme in their respective weight classes. Galinis wrestled a smart match and upset James Fotis (#6 migrappler.com) in the final 30 seconds. Lucus Pienton was too much for Derek Mohr from Lowell, while collecting a major decision 11-3. It took Ryan Ringler overtime to defeat Isaac Torrey (#3 migrappler) from Forest Hills Central. Galinis, Pienton and Ringler are now each two time Ok-White Conference Champions. Trevor Marsman (103), Aaron Smith (135), and Anthony Brew (145) also made the finals for Cedar Springs. Andrew Vangessel, David Erxleben, Phillip Elzinga, Logan Hull, Fernando Pedraza, Chris Shafer, Landen Totten and Paul Duran won matches and scored for the team as well. With a 5-1 Ok White dual record the boys claimed second place overall in the Ok White. Action continues with team Districts at Sparta High School on Thursday, February 8, at 6 p.m.